﻿ Is Resilience Too Accurate to Be Useful? Is Resilience Too Accurate to Be Useful? ‘Toward Resilience’ is a series on the meaning of global resilience and vulnerability today. The original version of this article appeared on International Alert. Resilience is a wonderful metaphor. It somehow conveys in a single word the qualities of bending without breaking, of healing after an injury, of tensile rather than brittle strength. Oak and palm trees are resilient to the power of strong winds, before which they bend and then straighten again. Resilient people pick themselves up after being knocked down, draw on their reserves of ideas and strength to deal with difficult challenges, or hunker down until the gale has blown itself away. Resilient economies bounce back, and resilient ecosystems restore themselves after the fire or the flood has passed. Resilience is not necessarily a good thing, of course. Patrimonialism and corruption can be resilient to change, as can power dynamics which sanction the marginalization and harm of women, children, or vulnerable people. American academic Andrew Nathan writes of the Chinese Communist Party’s “authoritarian resilience,” i.e. its ability to adapt and continue to thrive despite its authoritarian, undemocratic approach to power. But most often resilience is used to describe positive and useful features of society. International Alert is a peacebuilding organization. We say peace is when people anticipate, manage, and resolve the inevitable conflicts which arise in and between societies, and do so without violence; and we describe communities and societies as resilient when they do so. Their resilience in the face of stress is largely due to the nature of relationships and institutions, which provide them with tensile, rather than brittle strength. Freedom and equality of opportunity are key indicators of relationships and institutions conducive to peace. Organizations and thinkers in the humanitarian sector have long seen resilience as a quality to be sought after by communities vulnerable to natural disasters: the storms, droughts, floods, and famines after which they need to bounce back. Resilience is central to the idea of disaster risk reduction. My colleague Janani Vivekananda, in her research in South Asia over the past couple of years, has looked at how households and communities respond to environmental stress linked to climate change. She finds that communities most able to cope with stress are resilient in terms of their economic and physical assets, but also their range of opportunities and choices, their access to social capital, their links to relatives elsewhere, and in terms of the quality of governance. Good governance is good for resilience. The 1990s vogue for livelihood security among international development organizations also made a great deal out of the need for resilience. Economic assets, knowledge, access to services, good governance, gender equality, and social capital were all seen as elements of resilience to insecurity. Meanwhile the International Dialogue on Peacebuilding and Statebuilding, a club of rich and poor nations and intergovernmental organizations, identifies reducing fragility and promoting resilience as key to the emergence of peaceful and developmental states and societies. So, resilience is not merely a useful metaphor, but one which expresses a powerful idea which we would do well to try and understand. If societies resilient to stress are less vulnerable to disaster and violent conflict, and if critical factors in their resilience include freedom and equality, then building resilience to stress must presumably be an ambition worthy of us all. If resilience is such a useful analytical concept, and such a critical feature of human security, why is it going out of fashion again, just at a time when international discourse implies there ought to be a growing consensus on the need to promote resilience as an antidote to the fragility and brittleness which – it is widely agreed – affect too many countries and regions and blight the lives of those living there? The IRIN article implied some development experts feel resilience is too plastic a concept to be relied on. Others were concerned that “resilience” in the wrong hands can be applied at too coarse a scale of analysis, and give rise to programming which is insensitive or blind to the vulnerability of some members of society, and which may thus unintentionally reinforce their vulnerability or marginalization. An example was given of a family’s coping strategy in which a daughter is married off at a young age. These are valid points that require a response. To my mind they are a good reminder of the need for accuracy in describing analytical concepts, and the need to combine values with intellectual tools. If actual coping strategies have a negative impact on vulnerable people, then policy and program responses can seek ways to mitigate or prevent that outcome. But if “resilience” is indeed headed for another period of hibernation, I suspect there is a deeper reason why. It is a very powerful conceptual approach and analytical tool, allowing a broad, comprehensive analysis of the extent to which households, communities, regions, countries, societies, or states are able or unable to deal with, survive, and bounce back from natural or man-made stress. For those with patience, the concept lends itself to participatory approaches to identify factors which increase or limit resilience (or, for those who prefer the glass half-empty approach, factors which increase or reduce fragility and brittleness). So far, so good. The problem is, those seeking levers through which to make significant changes which can be measured in terms of the typical lifespan of development projects, are unlikely to find them easily in a resilience analysis. Resilience is – almost by definition – not something that can easily be “built,” and certainly not built to order. The clue is in the word itself – resilience is something to be found in the nature of societies, hence a quality which grows organically. As Nassim Nicholas Taleb explains, it is the effect of finely woven networks. Resilience comes from education, and especially the kind of education which helps young people develop their curiosity and ability to adapt and continue to learn. It is to be found in networks of diverse reciprocal relationships between individuals and groups, on which they can draw to get ideas, help and resources in time of need. It is to be found in the freedom of men and women to make their own informed choices and to participate in politics. It is to be found in competent and accountable governance, in a free, functioning press, in fair systems of justice, and so on. And from the interwoven combination of all of the above. Unfortunately, those in power in more fragile, less resilient societies often see these kinds of features as good in theory, but unwelcome in practice. Rather like St. Augustine who prayed for chastity – “but not yet, O Lord” – they’d often prefer to enjoy the spoils of power for now. Meanwhile those in international development organizations who support these kinds of features in principle, are unable to promote them because they simply do not lend themselves sufficiently to logical frameworks, short-term projects, and the like. Our development institutions and organizations may not be adequate to the task of promoting resilience in fragile societies. And so “resilience” may be destined to pass back into hibernation. That would be a shame. Because ironically, it describes the problem of underdevelopment, human insecurity, and inadequate governance too accurately to be useful. Phil Vernon is the director of programs for International Alert. Sources: Food and Agriculture Organization, IRIN, Johns Hopkins University Press, Journal of Democracy, Taleb (2012). 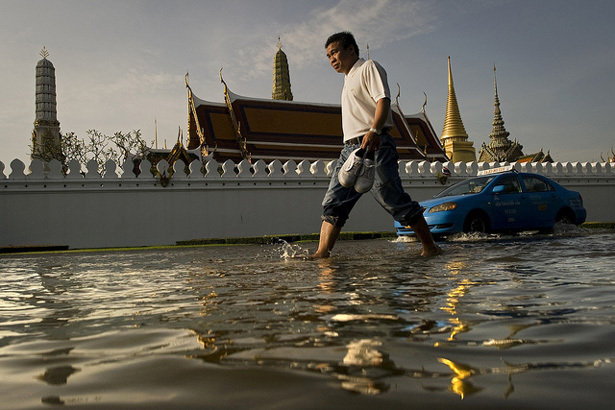 Photo Credit: Flooding in Bangkok, courtesy of Nicolas Asfouri/Asian Development Bank.